Cleveland Area History: Stanley Block Landmark Hearing TOMORROW! Stanley Block Landmark Hearing TOMORROW! Back in June, it came to the public attention that the historic Stanley Block had been condemned. The Stanley Block is located at 2121 Ontario Street, on the east side of the street, between Prospect and High. It was built circa 1874. 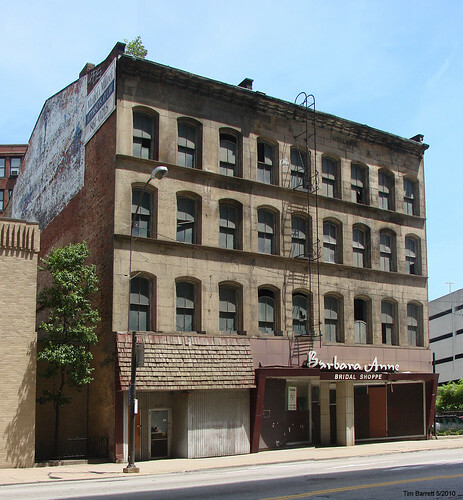 It is one of a few stone-faced commercial buildings of this vintage still standing in Cleveland. The Stanley Block has had an interesting history, due partially to the ballroom on its top floor, where many meetings and events were held. More detail on these can be found in my initial story on the subject. Previous efforts to designate the structure a landmark failed due to the opposition of the owner, who appears to want to demolish it. Now the city councilman associated with this ward is willing to override this opposition, in the public interest. A public hearing will be held on the matter tomorrow (Thursday), March 3, 2011 at 1:00 pm in Room 6 of City Hall, 601 Lakeside Avenue. If you are unable to attend, please consider emailing Commission Secretary Robert D. Keiser (rkeiser@city.cleveland.oh.us) or City Planner Donald J. Petit (dpetit@city.cleveland.oh.us) and let them know that you believe this historic structure is worth preserving. The Stanley Block (2121 Ontario) is a rare surviving example of commercial Cleveland, 1825-1890. * Moreover, the Stanley Block’s top-floor ballroom has also hosted many significant events. For these two reasons, the building is a prime component of the downtown urban fabric. All Greater Clevelanders are the essential owners of this fabric. For prime components such as the Stanley Block, legal owners are but temporary stewards. The immediate desire of any one legal owner to demolish his building should not decide fate of the fabric. Further, we must not allow an owner to effectively demolish a prime component by neglecting its maintenance. I urge you to act to keep the Stanley Block as a prime component in the downtown fabric. In representing a core Cleveland commercial building type, the Stanley Block (c. 1874) has several significant attributes. The building’s architectural origins lie in the Neoclassical brick commercial building of the New England seaboard, 1780s onward. Such buildings had by 3-5 story elevations, parapet firewalls and a projecting eave-line cornice. 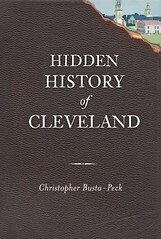 Thomas Whelpley’s Cleveland paintings indicate that the type was already common on Superior Ave, by the early 1830s. After the Civil War, such buildings could be facaded in sandstone, from local outcrops of the Berea and Bedford formations. The Stanley Block is of this type, with the segmental-arched windows typical of the 1870s. The building is of a core type and the local stone façade makes it unique. While the Stanley Block represents the type of building upon which Cleveland commerce arose, it is a rare survivor. For anyone that attended the hearing, how do you think it went? I wish I could have been there myself. Seriously? Does someone really REALLY want to keep this building...the one with the holes in the roof, trees growing out of the gutters, dilapidated roof materials...? Personally, I think the whole "this is a historic building" plea is one to simply drive up the value of the property so the current ownership can try to squeeze the casino-folk out of every nickel possible. This building is a wreck. Tear it down, make for something useful and pleasing to the eye. Members of the community have been working to try to preserve this building for more than 30 years now. It's only with the threat of demolion that it's become a public issue. 30 years? Maybe it is time to throw in the towel? Maybe focus on buildings that are reasonably rehabitable. Ones that perhaps actually have public interest. Perhaps one that does not currently stand in the way of ongoing construction projects. I'm not really in favor of the casino, but this building needs to go. I wish I could paste a photo here so you could appreciate my literal point of view. What a beautiful gateway into our city that will be! I've yet to see anything worth fighting for that can be had quickly. What is it you are fighting for? Keeping this dilapidated rat-infested eyesore filth-hole standing in the way of new development and growth? Is anyone actually working to raise funds to renovate this building? If so, how much has been raised? What are the future fund raising plans? How much is required in order to gut the filth from this building and turn it into something useful? Seriously, what is the pricetag? Right now this buliding is the perfect picture of inner city urban decay and decline. If this casino plan works, and people begin "pouring into" the city to throw away their cash at one-arm bandits under the seduction of blinky-lights and cheap booze, then every single one of those people are going to be greeting by this empty husk of Cleveland's past adequacies. What better what better way is there to remind each and every one of them that Cleveland is a city in decline? There are folks here that I work with that have been looking down upon this hole for 23years, have never seen it in use, have never seen any renovation - other than the conveniently recent banner that has been hung - or any interest in this pit whatsoever. Several weeks ago the front doors were opened and the odiferous stink that wafted from those portals was powerfully pungent enough to make passing pedestrians physically ill. Whom are you courting to put up funds to renovate this location? It may be a little late, but I propose contacting Marvel and asking them to use it as a prop for the Avengers movie - perhaps a location where HULK SMASH! I'm sorry I just cannot agree with trying to save this building. There must be other locations in Cleveland that would be worth fighting for that hold the public's interest. There must be. Just a quick positive note: there is actually some activity outside of your building. Someone has erected a barrier around one of the entrances and it looks like a job box or generator is out there. There have even been actual workers going in and out of the place over the past few days. I feel sorry for them, yet I'm strangely pleased that there is some actions being taken. I'm hoping they are placing demolition charges, but if someone is actually going to fix the place up...well, I guess that would be OK too. I'm oddly saddened to hear that this building is going to go. Saddened because of the delays in making the decision. Saddened that the owners, whom have had-what? 21 years? to fix up this building have done nothing. Even when faced by deadlines and imminent destruction, they have done nothing. Shame on them. I'm glad to see that this blight is to be torn down. I'm disappointed that those that could have done something ended up doing nothing. What will the end result be? A crater around which a nice new parking facility has been built? I was surprised and saddened to see this building being torn down today. It was a great piece of history, another one lost to the wrecking ball.